President Emmanuel Macron's response on Monday went further than the fiscal measures detailed below. It was indeed up to the President to do his mea-culpa for his personal style, often seen as arrogant and removed from the reality of the French people, and for questioning his leadership methods. For the last 18 months, he had indeed considered that having been elected on a new political model (different from the traditional right-left divide) exempted him from consulting the intermediate bodies, in particular, the trade unions, or the local authorities. The main tax reform, on the housing tax, did not put him in front of a good number of town halls. Even the members of his own LREM party, with their homes targeted by the most radicalised yellow jackets, have shown their resentment towards an executive who seems to have little regard for them. This is a 180° turnaround as the President has promised to consult local authorities again, region after region, on the forthcoming reforms and to launch a major debate on a "new contract for the nation", including in terms of taxation, recalling the steps he had taken to prepare for his presidential campaign in the second half of 2016. It is not a guarantee that this will be enough to calm the most extreme activists, of whom more than a thousand are in custody, but this time the President seems to have convinced some beyond his electoral base (one-quarter of the French) since about 40% of viewers polled after the announcement (23 million viewers!) said they were rather convinced. But is it possible to do better? Knowing that in the first round of the presidential election, 24% of the French abstained and 30% voted either for the extreme left or for the far right, it seems very difficult. Unsurprisingly, polls on Monday show that a majority of supporters of traditional parties (outside far right and left) now want the movement to stop. We continue to believe that the number of protesters will continue to shrink, but could become even more radical in their resistance, forcing a security response. Indeed, even if the number of protesters has dropped each Saturday, the degree of violence and the number of arrests has been increasing. The persistence of the phenomenon should allow the government to win the "battle of public opinion" by the end of the year. Finally, the attacks in Strasbourg on Tuesday night, which resulted in three deaths, led the Interior Minister to bring the Vigipirate anti-terrorist plan to its highest level, which could have the effect of limiting the gatherings in Paris in the coming days. The measures announced on Monday should have more impact on purchasing power, which was already up in the second half of the year thanks to the first tax measures, already postponed, by the Government. However, if oil prices have affected the perception of this increase in 2018, the opposite should happen in 2019 as prices, both in the markets and at the pump, are falling: 8.5% less on unleaded, 6.5% less on diesel since the peak of October. 1) The potentially most significant concession for the remuneration of work in France is the decision to accord a tax exemption to the end-of-year bonuses. This way of associating the companies with the measures taken and making an effort toward collective action could influence the way in which the wages are paid in France and provoke a de facto reduction in the gross-net wage gap. 2) Minimum wage earners should have a higher activity bonus of €100 net per month from January 2019 while the minimum wage (SMIC, currently €1.498 gross / €1.185 net) will increase as expected by 1.8% from January. This concerns 2.6 million households. We, therefore, estimate the cost of the measure at about 0.13 percentage points (ppt) of GDP in 2019. 3) All employees will benefit from the total tax exemption for overtime work, a mechanism already established under Nicolas Sarkozy and removed under François Hollande. The measure benefits low and middle-income workers to the extent that these employees can make more use of overtime work. The restoration of this measure was partially planned for September 2019. We estimate the cost at 0.15ppt in 2019. 4) Pensioners with monthly incomes of between €1,200 and €2,000 will see the cancellation of the extra social contributions decided earlier this year. However, they will not benefit from the reduced contribution rate that benefits the poorest (up to €1,200 per month), or 3.8%, but will have a rate unchanged of 6.6% (against 8.3% for pensions exceeding €2,000). 5) Other measures already announced are maintained, such as half a billion additional premiums for the transition from polluting diesel to lower emission cars. 6) The wealth tax, which has been replaced by a tax on real estate fortune, is not reintroduced. Finally, the government will have backtracked only on carbon taxes and higher contributions for modest pensioners. The fact is that the multiplier effect of these additional expenditures will probably be limited, so we do not think that they will be able to fully offset the lower growth caused in the fourth quarter by the movement in certain sectors, notably logistics and retail sales. The extent of the impact depends mainly on the extension of social movements during the end-of-year holidays and in January. We are not revising our growth forecast of 1.6% in 2018, but it is not excluded, if the “yellow vest” movement continues, that growth falls below our forecast of 1.4% in 2019. 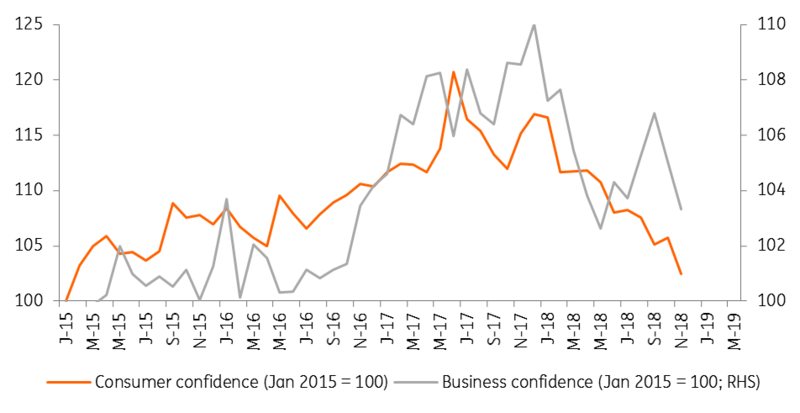 The figures for business confidence published by the Bank of France this week showed a sharp deterioration that erased the renewed confidence registered since the summer (see chart below). Business confidence, however, declined less than consumer confidence whose purchasing intentions collapsed in November. The level of confidence is likely to reinforce the fears described above and related to the effects of the movement at the beginning of the year 2019: if it stabilizes around this level in the first quarter as we expect, it would be consistent with growth of between 1.0% and 1.5% in 2019. Adding the effects of slightly lower GDP growth to a higher deficit in 2019, it is unlikely that France will have a deficit below 3% in 2019. The 2019 budget was already impacted by the recovery of SNCF's debt and the transformation of tax credits for competitiveness into lower charges: it was already forecast at 2.9%, close to the limit. This should be exceeded, with the deficit reaching 3.3% and the debt nearing 100%. Nevertheless, we believe that the downward trajectory should be maintained. In the coming months, the Government should detail corrective measures aimed at reducing public expenditures. We, therefore, maintain a deficit forecast of less than 3% in 2020 or 2.9% instead of the previous 2.6%. We do not think that this deviation is likely to fuel the debate around the vote of confidence tabled by the Socialist Party, which should be forgotten as quickly as it was proposed. It should be noted that this forecast and cost computation could be revised upwards when some measures’ impact will be clearer and in particular the impact of the tax exemption of end-of-year bonuses. If the shock is temporary, the least we can say is that it fails badly at the European level. Italy has indeed been forced to review its budget to avoid a new Excessive Deficit Procedure, one that France itself officially ended only last June. Both situations are however far from being comparable since even the blip of 2019 does not put into question the trajectory of the French public debt, which should decrease in the next few years. If we think that the debate around a new Excessive Deficit Procedure for France is largely exaggerated, France’s position on Eurozone reforms could be more difficult. As long as President Macron has not shown that France can be reformed, the rest of Europe, especially in the north, will not be ready to support risk sharing or tax transfers among Eurozone members. The small steps that should be endorsed this week by the European Council in terms of the budget and Banking Union, and which acknowledged some French demands, may, therefore, be the last for a while.